I picked these two beauties up a couple months ago from Sephora and am just now getting to blogging about them. 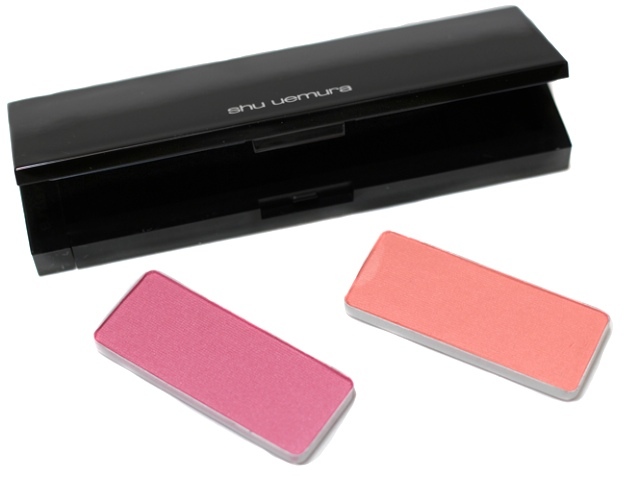 I should have done it sooner because Shu Uemura makes some great blushes. 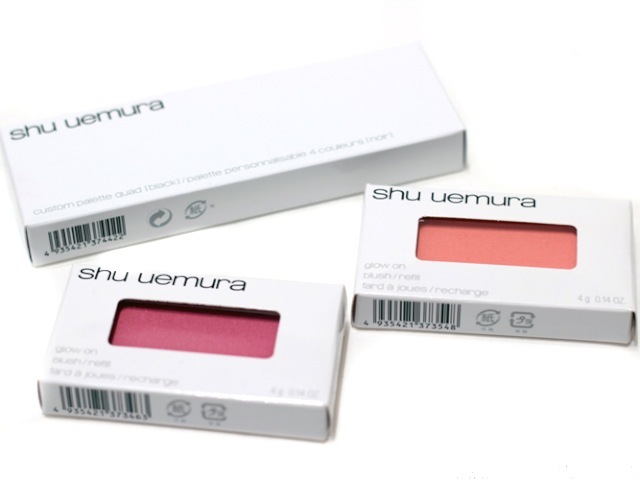 Shu blushes come individually packaged in pan form, so you will need a palette to put them in. I went ahead and picked up a "quad" case from Shu (more on how the compacts work later), but you can also just stick them in any palette you have handy. You will need some magnets though, the pans are not magnetized. There are only two finishes available: Pearl (P) and Matte (M). Both apply smoothly. 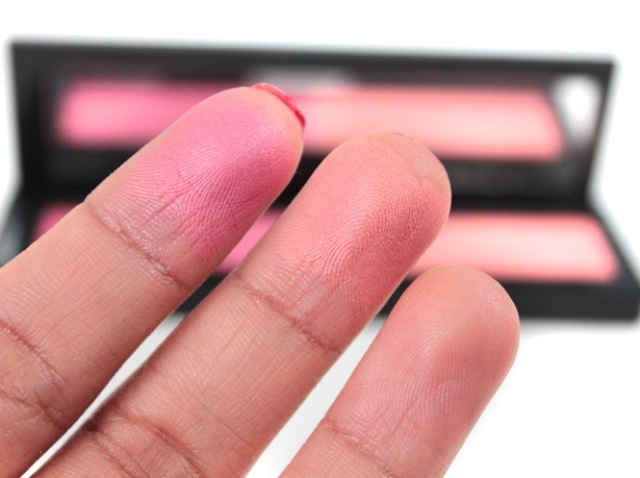 The matte blushes are velvety and natural on. 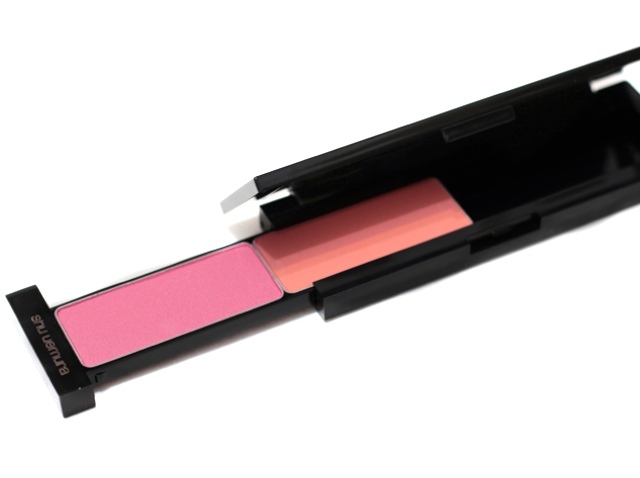 The pearl blushes have subtle shimmer, which adds a luminosity to the skin. P Vivid Pink 385 - a bright rose pink. In the pan, there's some silver shimmer, which provides a subtle sheen. P Medium Peach 560 - a vivid peach with specks of gold shimmer. Once again, the shimmer adds a pretty sheen. Both have excellent pigmentation, they blend easily, and their staying power is up there. Back tracking to the cases that Shu Uemura sells. They come in two sizes: a duo and a quad. These custom cases hold blushes and eyeshadows. 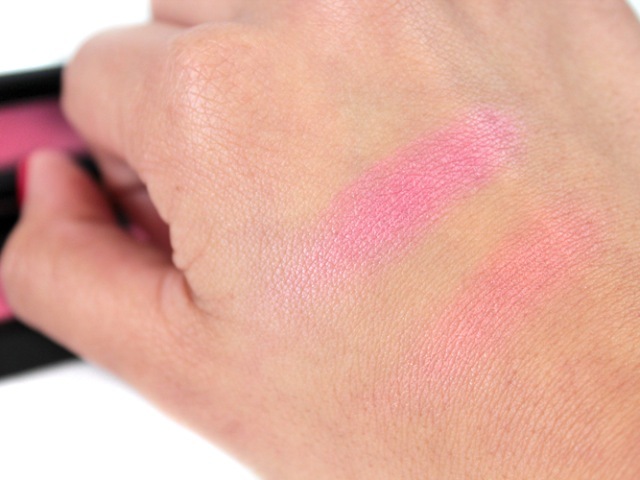 A duo holds a combination of two eyeshadows, or one blush. 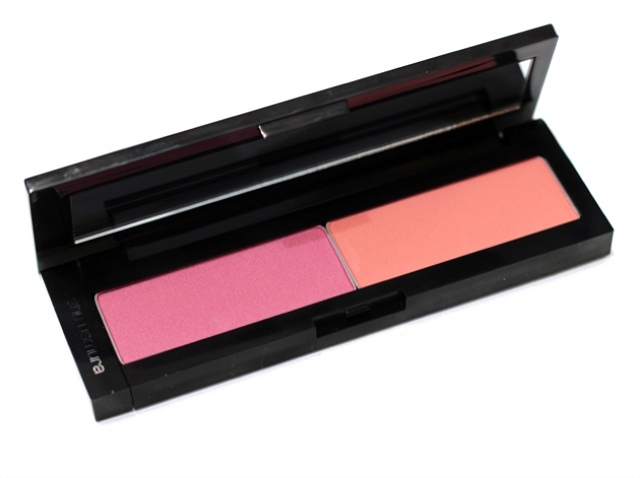 A quad holds a combination of four eyeshadows, two blushes, or two eyeshadows and a blush. If you're in Canada (more specifically around the GTA), you can find Shu Uemura products at Holt's, or at the Eaton Centre Sephora. I had no idea that Sephora at the Eaton Centre had Shu products! Thanks for mentioning it! How much are they?